SENIOR recruits James Gwilt and Adam Cooney were standouts in Essendon's final training session of the year, as coach James Hird introduced match practice to the Bombers' 2015 pre-season for the first time. Playing in defence, Gwilt looked sharp and read the ball well in the air to combat attacking forays and then offer some rebound. 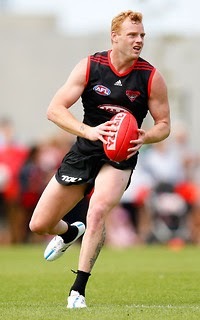 His former St Kilda teammate – and new one at the Bombers – Brendon Goddard, said the 28-year-old had enjoyed a strong start to the pre-season as the club looks to add his experience to its backline. Where's your club at this pre-season? "He's training well and his body's in good shape. He's smart, he's a good ball-user, he's got a wealth of experience and he's played well in big games," Goddard said. "[His recruitment] adds a bit more depth, it puts more pressure on guys to perform and for spots in the team." Cooney was another excellent performer in the mini intraclub match, gathering plenty of the ball, showing good speed and his customary dash. Goddard said Cooney was in terrific condition, having overcome the knee injuries that threatened his career in 2011-12 at the Western Bulldogs, and that the club's list was old enough to now consistently compete in the finals. "With more experience, more pre-seasons and more games played (by the squad) that's going to help, and obviously exposure to finals last year helps," Goddard said. "This group is getting to a position where it's old enough, they're in what history suggests is in the right age and games played, so in the next few years you'd expect the team to be performing well." The Bombers finished their pre-Christmas training block with a tough session on Tuesday, including approximately 40 minutes of match practice, which Goddard said was their first proper hit-out. Key forward Jake Carlisle missed the session as he deals with a bout of knee tendinitis, which he managed through the season. The club heads into the new year feeling there is an end in sight for the ASADA saga, which has dragged on for almost all of the two years Goddard has been at Essendon. "It's not completely [resolved] but I think everyone now is seeing light at the end of the tunnel," Goddard said. "We don't talk about it. "Hopefully by the middle of February, [or] hopefully by the end of February, it's all washed up and there is a decision made. I think that's realistic."